About Lesley Beth And Her Perfect Cross-Generational Edutainment Solution for Care Facilities! Note: The Jazzles Academy is based on Lesley Beth's unique 'Jazzles ELA' program, the only fully developed 'Arts Integrated' Multimedia Program that also incorporates research based Visual-Auditory-Kinesthetic learning style principles. As such, it is ideal for cross-generational 'edutainment' that delivers serious benefits for management of care facilities, the residents, the staff and their families. Life comes into focus when you're teaching Vietnamese boat children. Rescued at sea; escaping from pirates; interned for months - they've entered kindergarten, shy, withdrawn, lacking confidence and often with very limited English. Notwithstanding it was decades ago, I still remember the children carrying the burden of 'great expectations'. Then, we didn't have the luxuries of computers and interactive whiteboards - just 'Big Books', word lists and some nursery rhymes that hardly set the kids on fire. It was the heyday of 'Sesame Street' and 'The Wiggles'. Educationally, I saw how I could use the enjoyment and the memory power of songs as the basis for creating highly engaging mini-literacy units, and particularly so for our growing intake of ELL children. The outcome is Jazzles ELA - a big project with ambitious goals. It's taken years and significant cost to develop Jazzles as an all encompassing multimedia system that features a unique 'Learn to Read' resource. Today, there's a whole industry making money by telling us all the things wrong with our schools, our teachers, and our education system without actually contributing any practical classrooms solutions. I did. I hope you agree. Now my happiness comes from seeing the real difference Jazzles is making - particularly for the disadvantaged. Lesley started teaching at the tough end. Graduating from college, her two year probation began in an Australian outback town with a kindergarten of diverse children - many so poor they had never seen a book or held a pencil. In the dust of that town, Lesley discovered how to use her gene pool talents of music, songs, drama and art as the essential keys to engaging her class in active learning. Fast forward 20 years. Engaging mixed ability classes is our biggest challenge, and Lesley has the only real solution for beginning reading. Jazzles ELA, the only song-powered VAKT ELA program. Awards Working with the Best. When Lesley goes recording, she only works with top editors and musicians. With Underwater Songs, world-renowned musicians include Clive Lenditch, who's played acoustic guitar with stars like Manhattan Transfer, Peter Allen, Idina Menzel and Neil Sedaka. Additional artists include drums by Gordon Rytmeister (Tom Jones, The Commodores, Bob Geldof, Roger Frampton, Bobby Shew, Anthony Warlow and Eartha Kitt) and legendary electric bassist Mark Costa, who's performed with The Temptations, Tom Jones, Leo Sayer, Go West, Chris Isaak, Debbie Reynolds and Thelma Houston. Lesley is a recipient of Honorable Mentions by American Songwriter Magazine and LyricAwards.com for her poignant environmental song 'While Watching Wales'. From over 11,000 entries, Lesley's humorous 'Swishy Friends' song (about being a fish in a 'fish' school) was nominated a Semi-Finalist in the 2004 International Songwriting Competition. The ISC features the most prestigious panel of judges in the world of songwriting contests. Lesley's video production experiences include working with Michael Stavrou, (sound engineer for Elton John, Paul McCartney, Cat Stevens, the Beatle's Sir George Martin), and digital coloring by Warren Lynch of 'Lord of the Rings' fame. Want Top Quality Edutainment Songs? Visit Underwater Songs - High Definition Song Videos. Escape into a world where fins and tails move to the ebb and flow of calm, rhythmic music and emotive lyrics, inspiring love and care for our sea friends and their environment. Lesley's new Underwater Songs website includes high definition video clips and mp3s to motivate and inspire research projects and creative writing. What Makes Lesley Different Songs that Stick in Your Head! 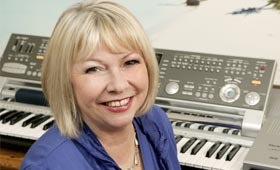 Lesley produces her songs as cartoons with lyrics as subtitles to develop reading skills. She specializes in a particular style of learning song called 'ear-worms' or 'repetunes'. The subject of numerous research studies, these are scientifically defined as 'a piece of music that gets stuck in your head so you hear it, even when it is not being played'. It's skill widely applied in advertising jingles. While most learning programs stop at the pedagogy, Lesley's teaching experience has given her vital experiential knowledge that optimal learning occurs with happy children in an engaging environment. Lesley is the only teacher-songwriter anywhere, to apply this unique set of skills strategically to create a transformative 'Big Picture' ELA pedagogy. Talented Artist From books to stage backdrops! Between teaching, composing, and video productions, Lesley loves converting depressing school walls into woodlands or flowers with an almost '3-D' effect. 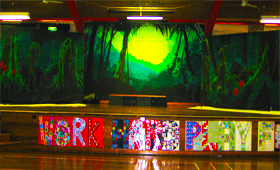 Her December 2012 projects included this 480 square foot (45 square meters) backdrop for a 'Jungle Book' school musical. : Escaping the anarchy at 'Swishy Friends Park', where fish have hope! The media let's us glimpse the oceans the way we want to imagine them. The reality is different. Lesley's eco-entertainment project focuses on the importance of global care for the marine environment to keep the dream alive in a series of fantasy stories and songs that ebb and flow with reality! Jazzles Academy requires little if any training because essentially it is enhancing/updating traditional early childhood classroom activities. Where required, Jazzles Academy is supported by Citrix GoTo Meeting or Skype Conferencing. Jazzles Academy will work on any Windows and Apple system running Internet Explorer or Firefox web browsers. That includes computer connected TVs. It can also run iPads in the USA, UK and Europe but not in the Asia Pacific region. Can be network installed. 'Integrated Arts' has become a bit of a buzzword. But as you will discover, there is a lot more than just integrating bits of content here and there. 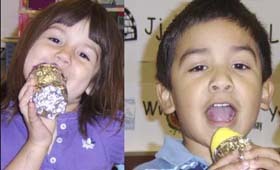 Using the Jazzles ELA program as its basis, every feature of the Jazzles Academy is linked creatively and thematically. The program uses the principles of music therapy and creative arts therapy widely used in care facilities. The only difference really is age targeting. However a key feature of Jazzles ELA is that it never uses any babyish concepts or language. So no matter your age, you'll enjoy all the catchy songs that stick in your head! Jazzles ELA is true integration and that is very difficult to find. It requires a combination of pedagogical vision, teaching experience, and a spread of creative talent, particularly in the area of music. Lesley has all. Extensive research has failed to find any program like Jazzles ELA that integrates the arts in such a fun and engaging way yet provides academic rigor. If you would like to know more, click here for information.